As the saying goes, “It takes a village …”, and often, in today’s Western cultures, we like to compartmentalize the upbringing of our children. We prefer to leave their education to the school system, their moral compass to the church, and the personal nurturing to adulthood as the responsibility of the parents. But, the longer I live, the more I believe that while, yes, the parents are the foremost molders and shapers of the young lives within their care and should put forth a stronger effort to regain some of the control relinquished to other parties, the proverbial “village” still plays a large role in shaping character and personal history as children grow up. 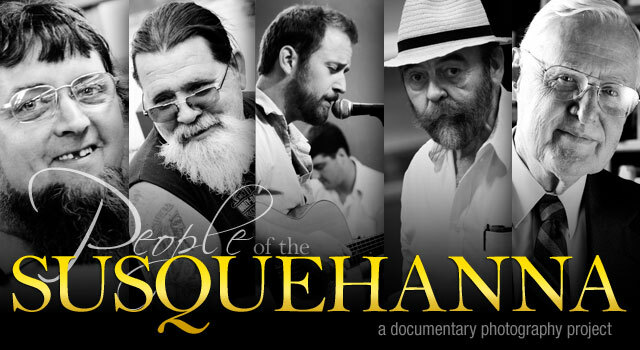 With this in mind, I set about to document the people from the Central Susquehanna Valley, the greater community, or “village,” which has shaped so much of my individualism. As an adult on a quest to somehow stumble upon maturity, I have come to a greater understanding of just how influential this region has been on who I am today. What was once an area primarily settled by the Pennsylvania Dutch, the Central Susquehanna Valley now comprises myriad cultures, an emerging melting pot of ethnic, political, and social diversity. These are the people, these are the faces who make up my home.